When Adam Scott bogeyed the 16th to fall to four over for the tournament, he knew he could not afford another mistake. He stood statue still over the ball for several seconds before his approach at the par-5 17th, prompting his caddie, Steve Williams, to intercede. He encouraged Scott to back off and reboot his preshot routine. Scott, who has three top-five finishes in this event since 2012, birdied the 17th and then parred the 18th — after again stepping away from his approach to let a gust play through. He posted a 74 and a 36-hole score of three over, and made the cut. Williams, he said, encouraged him to take his time, to wait a few seconds. “Stevie’s great attributes are he feels what’s going on so much — more like a player than a caddie, I think,” Scott said. Mickelson was competing in his first major since Jim Mackay, whom he had employed on his bag since 1992, left the caddie shack for the broadcast booth. After swearing off his driver during his practice rounds, Mickelson had it at his disposal on Friday. He used it three times on the back nine, missing the fairway each time. Mickelson, 47, lost a ball on the par-4 third when he hit a fairway wood off the tee, leading to a triple bogey. Starting at the seventh, Mickelson bogeyed six of seven holes for a 77. It was the first time in 17 starts in the wraparound season that Mickelson had failed to advance to the weekend. “It’s just one of those things where if it starts to go bad in these conditions, it’s just going to go bad,” said Mickelson, who bypassed last week’s Scottish Open, which he usually plays to prepare for this event, to squeeze in one last vacation, in New York, with his family before his daughter Amanda starts college. Mickelson’s younger brother, Tim, is filling in as his caddie, and he tried to keep the mood light. He whistled as he returned Mickelson’s putter to his bag off the 16th green and hoisted it onto his shoulder. In his regular job, Tim Mickelson is the manager of the Spaniard Jon Rahm, 22, who was playing directly in front of Mickelson’s group. 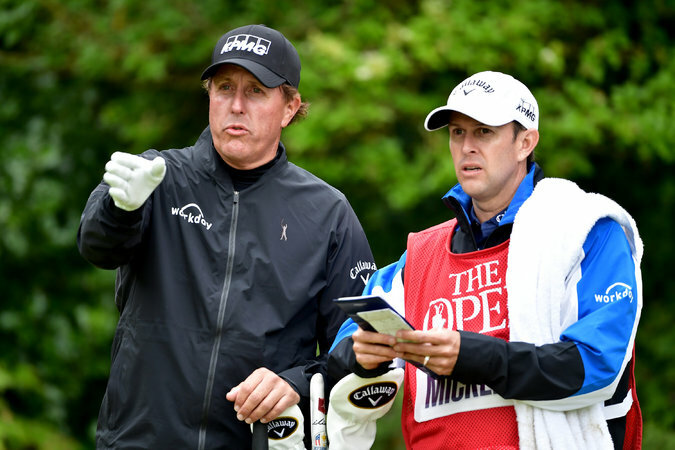 “I’ve been trying to see how he’s doing,” Tim Mickelson said to a photographer during the short walk to the 17th tee. Rahm is at three over, so at least Phil Mickelson’s brother will get to stick around.